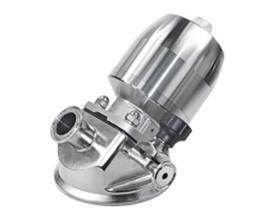 AV-10BP sanitary tank bottom valve is used extensively in the tanks and vessels for pharmaceutical, biological, and food industries. This series includes tank bottom diaphragm valves, tank bottom seat valves, elbow-type tank bottom valves, etc. Optional: EPDM/Silicone/FPM(Viton), all seals complying with FDA 21CFR177.2600. Tightly structured, the valve can be installed in small space. Discharge materials without blind angle and residual leakage. Various standards: DIN, 3A, ISO/IDF, BS/RJT, etc. End connections: Sanitary Clamp, Flanged, or others upon request. Both manual and pneumatic operations available as customers require. Pneumatic head with or without C-top and position sensor. Air to Air (AA)-Air to open, air to close.